Mrs. LanceAround’s maternal side of the family came from rural Minihaha Springs, West Virginia. Her mother’s grandmother was a full blooded Native American. Like many people who lived in that part of the country at that time, this was a source of shame and embarrassment for Mrs. LanceAround’s family. Therefore, it was not talked about. Rumble: The Indians That Rocked The World is a documentary that demonstrates just how much Native American influence there is in modern day rock and roll music. Ironically, the reason it’s not known is the same reason that Mrs. LanceAround’s family never spoke about her great grandmother’s heritage. This fascinating documentary takes a look at some of the most popular songs of our era and demonstrates how they were directly influenced by Native American culture. Indeed, several prominent musicians may have been assumed to be black but were, in fact, Native Americans. These include such musical icons as Jimi Hendrix, Link Wray, Charley Patton, Mildred Bailey, Jesse Ed Davis, Buffy Sainte-Marie, Robbie Robertson, Randy Castillo and even movie Executive Producer and 1988 lead guitarist for Rod Steward, Stevie Salas, who was in attendance for this film. The film provides side by side comparisons of old, indigenous tribal ceremonies compared to modern pop music where the rhythm and drumming is demonstratively identical. One point of interest was an old photograph that showed three bathroom doors. One was labeled “white,” one was labeled “black,” and the middle one was labeled “Indian.” This kind of blatant prejudice is seldom exposed in our school systems. This well made film will open your eyes to a piece of our American history that has been unspoken for far too long. 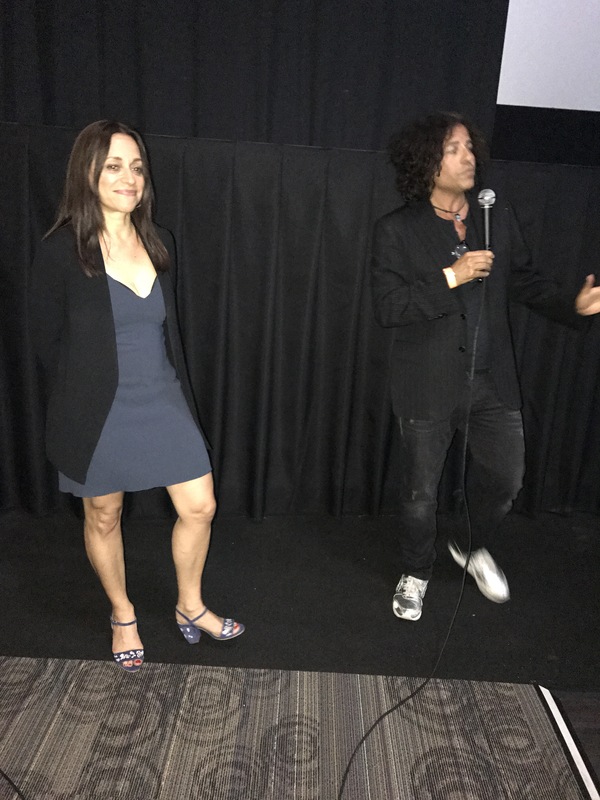 After the film, Executive Producer and featured subject Stevie Salas spoke with the audience. You know, if you look at my birth certificate, it says my mother’s white and my father’s white. If you ever saw a picture of my mother and my father you would laugh at that. They’re not even close to white. I’ve got nothing against being white. As a matter of fact, when I was playing rock and roll in the early days with Rod Stewart, I never felt like I looked Native. I felt like I fit right in with the rest of them. Native American people don’t have a lot of role models to look up to. We can’t look up to Geronimo forever. We wanted to find some new ones. It sounds crazy, but it’s true. There was an unwritten history of influence going on. We all thought Charley Patton was a black man. Has anyone ever seen a photo–you always see ones in American history that say, “black bathroom, white bathroom”–I’ve never seen one that said, “Indian bathroom.” I’ve never seen one. They [my other producers] found one. How we got so many big stars is most of these guys I knew and I grew up with. We all came up together. I was able to call people personally. If you’ve got to call an agent it never really works, it’s one in a million and it’s all bullsh**. Being in the film wasn’t just about being an Indian. Every Indian just doesn’t get in the film. This was about Native American people who influenced pop music history. I’m a guitar player, who wanted to be a rock star, who happened to be an Indian. Tell all your friends–we’re going to go theatrical this summer and we want to do some good box office. This entry was posted on April 28, 2017 at 9:05 am and is filed under Art Community. You can follow any responses to this entry through the RSS 2.0 feed. You can leave a response, or trackback from your own site.